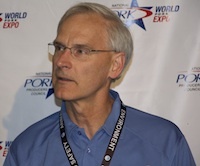 Chris Novak, CEO of the National Pork Board, announced plans for a new common industry audit platform for pork producers, packers and processors. Using the existing Pork Quality Assurance Plus (PQA Plus) program as the foundation, the year-long audit team is nearing the final stages of completion and the initial common audit framework. 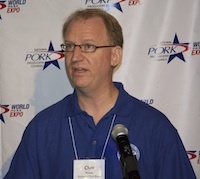 The program was unveiled during World Pork Expo 2014. The goal of the common audit program is to provide consumers greater assurance of the care taken by farmers and pork producers to improve animal care and food safety. It is also a mechanism to reduce the need for multiple audits throughout the food chain. 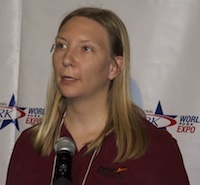 The common audit program framework according Sherrie Webb, Pork Checkoff, will focus on animals themselves, facilities, caretakers and record and record keeping. “This approach has never been more critical. 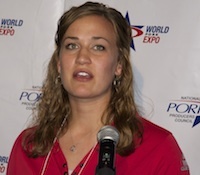 As pork producers, we know that we must do more to reassure consumers about our commitment to improving animal care,” said Emily Erickson, a member of the Industry Task Force and a pig farmer from Jackson, Minnesota. She noted at the same time the industry needs a clear and consistent approach that can ensure they are doing the right thing and this common framework delivers on that promise. The Industry Task Force is meeting later this month to finalize the common audit framework and it will be rolled out Mid to late July 2014.